Porketta is a seasoned pork roast that was popular with the Italian immigrants who came to Minnesota to work in the iron mines. Mix together seasonings and rub over all surfaces of pork roast. Brown roast in a little oil in large skillet over medium-high heat, turning often to brown evenly. Place potatoes and garlic in a 3 1/2-4 quart slow cooker, pour broth over and top with browned pork roast. Cover and cook on low for 8-9 hours, until pork is very tender. Slice pork to serve with vegetables and juices. 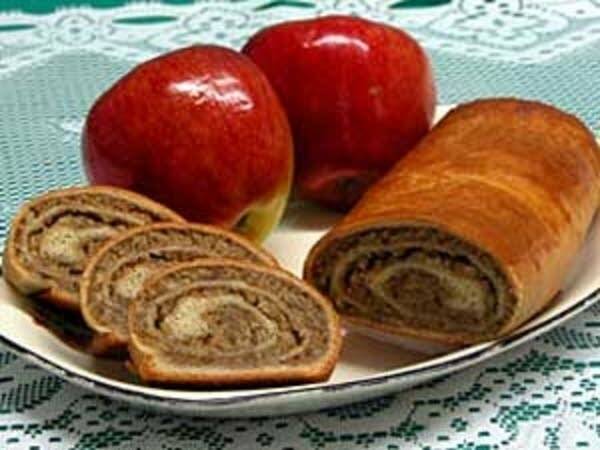 Potica (pronounced puh-TEET-suh), is a delicacy brought to the Iron Range from Eastern Europeans. It's made from buttery pastry dough rolled into very thin layers. That's covered with a layer of brown sugar, spices, and walnuts. Then it's rolled into a small log-shaped loaf, and baked. Each slice of potica is a spiral of pastry and moist, sweet filling. In a large mixing bowl, cream the butter with the remaining sugar. Add the egg yolks one at a time, beating well after each addition. Add the yeast mixture, remaining milk, 4 cups of flour and the salt; mix well. Add the remaining flour, 1/2 cup at a time, stirring well after each addition. Lightly grease one or two cookie sheets. Deflate the dough and turn it out onto a lightly floured surface. Divide the dough into two equal pieces and roll Out to 1/4- to 1/2-inch thickness. Spread each piece with melted butter, honey, raisins, walnuts and cinnamon. Roll each piece up like a jelly roll and pinch the ends. Place seam side down onto the prepared baking sheets. Let rise until double in volume. Preheat oven to 350 degrees. Bake at 350 degrees for about 60 minutes, or until the top is golden brown. Cornish miners who relocated to the iron mines of Upper Michigan and Minnesota brought the recipe and tradition of pasties with them. The pasty is a meat pie with potatoes and other root vegetables, sealed and baked in a light pastry crust. The pie was wrapped in a kerchief to retain its warmth, and fit into the back pocket of miners' work clothes. For crust, mix flour, shortening, sugar, and salt till crumbly. Add eggs, vinegar, and water. Knead one floured surface. Form a big ball, and cut into pieces about the size of a clenched fist. Roll out each ball to about size of dessert plate. Put about a cupful of filling on upper half of dough. Dot with butter (prevents drying out). Fold lower half of dough over filling. Press down edges with fork tines. Brush tops with eggwash for even browning. Prick tops with fork. Bake at 375 degrees for about an hour, or until golden brown. They can be made ahead of time and frozen until it's time to bake them. Sarmas are cabbage leaves stuffed with a meat and rice mixture, a traditional Croatian dish. Place cabbage in the freezer for a few days. The night before making the rolls, take it out to thaw. This process makes the leaves easier to handle. Andrej's European Pastry in Chisolm, Minn.